In Store: 20% off one regular priced seasonal item, includes heating and cooling products. Online: Up to 50% off outlet, save 50% off clearance. open box and more. Get a sneak peak at all their best deals and specials (in store and online) by viewing their latest circular. Print coupon for a 20% discount on one regular-priced floor care item. Save an additional 10% on Open-Box major appliances, in store only. Print coupon for an additional 10% off already reduced prices on open-box laptops, desktops, tablets, TVs and major appliances. Receive a 15% discount on health & fitness products as well as Fisher Price and Mattel toys. Best Buy is the largest consumer electronics retailer chain in the world! They carry a wide selection of brand name electronics, computers, cell phones, music CDs, DVDs, video games, appliances and much more. Their experienced team will help you make the choice that is right for you! 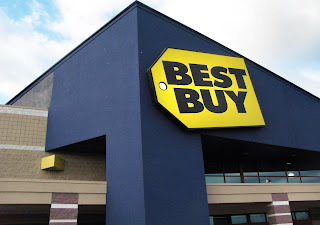 Shop at Best Buy for the latest in technology at competitive prices.